Sheldon Wolfe, author of Constructive Thoughts, has given this blog the Liebster Award, a method of recognizing good blogs that do not get much traffic. If each award recipient honors the commitment to nominate 5 other blogs, and does so within 10 days of receiving the award, there would be, within the first year, 5 raised to the 36.5 power = 3.2539072e+25 awards given. This is a a quantity that exceeds by orders of magnitude a reasonable estimate of blogs around the world, 1.81e7, tracked by Nielsen/McKinsey. (http://blog.nielsen.com/nielsenwire/online_mobile/buzz-in-the-blogosphere-millions-more-bloggers-and-blog-readers/). In addition to being clear, complete, and concise, I also aim for constructability. A decision to participate in a "chain letter" of any type can only be founded on the assumption that the instructions will not be followed by all the recipients. HearingShofar.blogspot.com -- I write it. Many science blogs: I don't remember their names because they automatically load to my home page. While not blogs, I subscribe to many e-newsletters on topics of interest. Beyond that, I love the surprise of wandering through the internet, with one idea leading to another. The first key to Lori's success is she started with clearly stated goals in mind. As the blog has grown reoccuring topics have emerged (such as "Wordless Wednesday", when allows pictures of interesting doors to speak for themselves...mostly), but in the early days of a blog deciding what to post can be very intimidating. Having these goals helps you identify good topics, and gives structure to the blog. The informal, personal style is also a major strength. I still believe that developing relationships with architects is the best way to get spec'ed, and the conversational tone does more to foster that relationship. If the blog felt like a constant sales pitch, or used very dry "professional" communication, it would not make that same personal connection. Especially for this topic. The original title of the blog was "I Hate Hardware", a tongue-in-cheek acknowledgement that many architects do not understand, are scared of, and get intimidated by hardware. The informality defuses the subject, making it more accessible. Navigation around the blog is very clear. At the top of each page are links to helpful pages, including a gallery, collection of building codes, spec information, and - my favorite - a big, red "Help!" button. The domain name is also great: descriptive, easy to remember, and easy to type. For kicks, I checked the site on my iPhone. There is not a mobile version of the site, but the design is simple enough that I was able to read and navigate around the site. Probably the most fascinating aspect of this blog is that it's the creation of a product rep, not a company. This is a valuable example for other internet-savvy reps out there. Because the blog is not, directly, about the product there is a good degree of freedom. Depending on your agreement with the company, you do not need their permission or support to post updates about building codes or pictures of badly done projects. An individual or small firm can often move more quickly than a big company, so you could have plenty of room to be the pioneer. A blog like Lori's also does two of the most important things a product rep needs to do: establish yourself as an expert in the field, and become the resource designers turn to when they have a question. I sat in on one of CSI's Product Rep Practice Group webinars recently; several participants were noting that while specifiers used to call reps when they had a question, now they almost always turn to the web instead. This type of blog does much to bridge that gap; specifiers go online to get their information, but they are still getting it from you. Commenting on blogs, forums, and networking sites is an important part of your online presence. Search engines are likely to find and index your comment, especially if it is on a well-known site, and links you post (when allowed) can send new traffic to your page. More importantly, it shows you and your company are participating in the conversation. But it is important to do it right. For a whiteboard that stays pure white, check out this glass marker board. Great for the corporate or classroom environment. I went ahead and published the comment - we post almost every comment we receive, except for the most obvious Spam, but review them first - because it does fit both with the topic of the post (white boards) and the theme of our blog (building products), but this comment fails on several levels to achieve its goals. 1. This was posted by "Anonymous", which does several bad things. Most importantly, it makes me not trust it. Anything I get, via any medium, without a real and recognizable name looks immediately like spam. If it has a real human name I will at least open it, instead of automatically deleting it, but the sender only has 1-2 sentences to get my attention. But this also represents a missed opportunity. Digital marketing is as much about developing your brand as an individual as the company brand; social media is about people, so your personal reputation is what brings people to your company. Posting anonymously is like sending someone a birthday card without signing your name; they want to like you, but do not know who you are. 2. The company or product name does not appear anywhere in the post. There is an art to doing this right, because overusing either makes a comment look like an ad. I recommend following the same guidelines as for a magazine article; focus on the technology and include the name as part of your credentials ("In my work for Chusid Associates, I've found that...."). 3. Clicking on the link brings you to a very busy, hard-to-read homepage. Most surfers will get there, look around for 10 seconds, and leave because they cannot find what they want. Instead this should point towards a dedicated landing page, with "Whiteboards that stay pure white!" in big, clear letters. Look for more on landing pages in an upcoming post. 4. This is not a well-written comment. Spelling and grammar are fine, but there is no sense of excitement, no sense of who this is for, no real motivation unless I was already looking for a white board that addresses this topic. That describes a very small part of the architectural market at any given time. If it had said, "See the lated improvement..." or "Learn how we made..." then you draw the much larger audience that does not currently need a white board but is curious about new products. Or better, actually respond to the post; but have an actual response, not a formulaic salutation ("I like what you said about....", not "Great post! Visit....") Also, consider an exclamation point. I am certain this comment was placed by a automated script; probably no one at the company has ever heard of our blog (too bad for them!). There is nothing wrong with using these scripts, if you use them well. I would recommend setting the script to notify you so you can write a custom response, rather than using a canned message. Anything canned looks like spam, and eventually that will get you in trouble. Commenting is a very controversial issue right now; there are as many views on the best way to do it as there are digital marketers, and many high-profile blogs forbid including links or have even disabled comments altogether. The general rule everyone agrees on, though, is be polite. You are a guest in someone else's home; if you cannot improve the conversation then stay quiet. "I spent all night reading it. It is like reading a history of my life. Most of the issues you deal with are the same I face everyday." Adding a blog to your company's website will increase your search engine optimization, making it easier for the people who are searching for you to find you through keyword searches. Blog on! To further prove the power of blogging, this blog post was added to a CSI newsletter under the section entitled, "Community" as "Member Blog: The Power of Blogging." Don't copy other people's stuff, write your own. If she means don't plagiarize or rely on form-letter posts, email chains, etc., then I wholeheartedly concur. If, however, she means write your own stuff instead of linking to others, I respectfully disagree. Granted, I don't think she would recommend completely eliminating linked/quoted material (see the 3:1 rule), but that's a suggestion I frequently hear. Usually with the rationale that quoting someone else promotes them in a space that should be promoting you. However, one of the best services you can provide to your busy readers is to bring them important articles from around the net, saving them from having to build the reading list it took you years to develop. As she says, though, add your own viewpoint to it. Reach out to blogs by reading and participating in discussions. Never leave a "nice post" comment. Put some thought & work into your responses. You want to catch the attention of other readers and the bloggers themselves, and make them ask "Wow! Who is this guy?" so they will click your name and visit the site it links to. 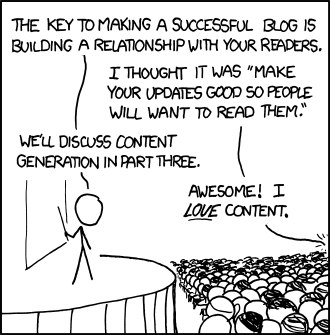 Always make your comments increase the value of that bloggers page. I think this is a too-often overlook piece of building blog readership. Part of the way people find you is through your participation in conversations they already follow. Furthermore, demonstrating your commitment to other people's blogs encourages them to participate with yours. Given the tightly define niches most building product manufacturers work in, the "rising tides lift all ships" philosophy is a powerful force online. Should building product manufacturers use Google Wave? As of yesterday, anyone with a Google account can now use Wave. But why should you? There are a number of helpful new videos posted, but they only discuss a few use-cases, none of which seem to fit our industry directly. Real-time communication? Great, but since all of us were working on separate schedules it was rare for any two of us to be logged in at the same time. Might as well use the phone or email. Collaborative document editing? Again, nice to have, but since our office has made use of Word's Track Changes feature for years we accomplished the same thing by posting the working document on our server. Inviting other participants? This actually had some value. It didn't become an issue on the projects we were doing, but many of our projects involve getting input from clients, editors, outside experts, code officials, our clients again, and, in one notable case, a very talented German-to-English translator. I can see the benefit of one-click invitations that add resources to the conversation as needed. Replaying Wave history? Another potentially useful feature. This allowed us to not only revert to previous versions of the document, but also share with newcomers the thought process and evolution of the document. Seeing who made each change provided a lot of insight into the reasons for the change, and helped guide the discussion by pointing the "why did you do that?" questions to the right person. Simple forums and comment engine? Many people see this as one of Wave's best uses, but again, is it really more useful than the existing tools? Comments on our blog work fine (please feel free to take that as a hint to comment below), so why make the switch? On the other hand, if you want a free and easy forum for your website, this could be a good way to set it up. Wave was billed when it first came out as "what email would be if it were invented today", and I think that a reasonable claim. However, email is by far the most commonly used internet technology, which means it's one that most people already know how to use. I can see Wave growing to become a highly useful, if not indispensable, tool in the future, especially now that anyone can participate, but for now the amount of effort required to shift organizations from email to Wave seems daunting. I recommend you do what we did: try it out for a few projects. Do one or two simple internal Waves first, then try expanding it to involve contacts from outside of your company. I'm planning on revisiting Wave now that it's had some time to mature, and will post my experiences later. Have you used Wave? Are you planning to? What features are most useful for you?